Whether you greet the new year silently or not, however, is less important to whether or not you have someone to welcome it with. This is why Cerg and I are thankful that despite of being away from our families in the Philippines, we still had friends and foster families in Japan with whom we welcomed 2011. Of course, it doesn't mean that we have to welcome the new year the Japanese way just because we are in Japan. 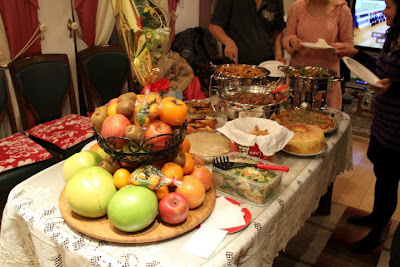 We still did it Filipino style, that is, with lots of fun and lots of food! Even without the lechon, the crispy pata, and the hamonado, we still had the roasted turkey, the bungi-friendly kare-kare, the "wet" morcon, and other diet-ruining food. Even without the noise of kwitis, five-star, and other firecrackers, we still had the noise, or rather the voice of Ate Minda, Ate Tess, and Ate Edna to listen to. Sa susunod magpatulog kayo! Even more important, I think, to the HOW and the WHO of welcoming the new year is the WHY of it. Without the reason for welcoming the new season, it appears to be just a practice of empty traditions. May we all have a blessed new year!